John Merbecke (c.1505-c.1585) is most famous as the composer of the first musical setting of the English liturgy, The Booke of Common Praier Noted (BCPN), published in 1550. Not only was Merbecke a pioneer in setting English prose to music but also the compiler of the first Concordance of the whole English Bible (1550) and of the first English encyclopaedia of biblical and theological studies, A Booke of Notes and Common Places (1581). By situating Merbecke and his work within a broader intellectual and religio-cultural context of Tudor England, this book challenges the existing studies of Merbecke based on the narrow theological approach to the Reformation. Furthermore, it suggests a re-thinking of the prevailing interpretative framework of Reformation musical history. On the basis of the new contextual study of Merbecke, this book seeks to re-interpret his work, particularly BCPN, in the light of humanist rhetoric. It sees Merbecke as embodying the ideal of the 'Christian-musical orator', demonstrating that BCPN is an Anglican epitome of the Erasmian synthesis of eloquence, theology and music. 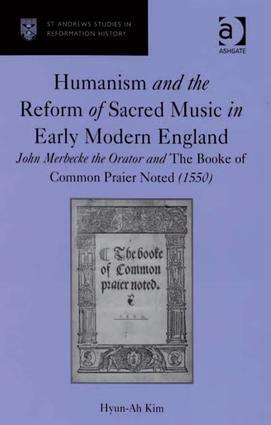 The book thus depicts Merbecke as a humanist reformer, through re-evaluation of his contributions to the developments of vernacular music and literature in early modern England. As such it will be of interest, not only to church musicians, but also to historians of the Reformation and students of wider Tudor culture. Contents: Foreword; Introduction; A humanist John Merbecke; Erasmian humanism and the reform of sacred music; Anglican plainchant in the making; Rhetoric and the reform of plainchant in The Booke of Common Praier Noted (1550); Conclusion; Appendix; Bibliography; Index. Dr Hyun-Ah Kim is a Fellow of the Centre for Reformation and Renaissance Studies at the University of Toronto, Canada.